When developing a program in Ruby, you may sometimes encounter a memory leak. For a while now, Ruby has a facility to gather information about what objects are laying around: ObjectSpace. There are several approaches one can take to debug a leak. This discusses a time-based approach, where a full memory dump is generated every, say, 5 minutes, during a time that the memory leak is showing up. Afterwards, one can look at all the objects, and find out which ones are staying around, causing the memory leak. Having Ruby, install the dependencies with bundle install. Having PostgreSQL, create the database with createdb mem_analysis. When getting dumps from Amazon S3, s3cmd may come in handy. If stored on S3, get the dump list. Update the bucket and date in the grep command to reflect your case. This stores filenames and dates in index.txt. Now that the database is loaded, we're ready to gather information. 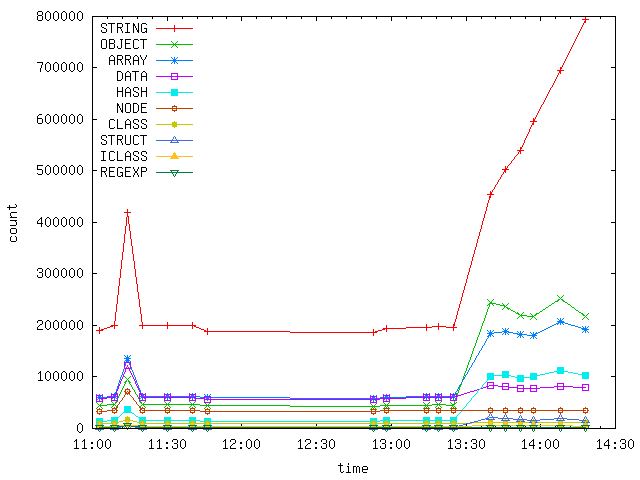 To find out what is causing a memory leak, we can look at graphs plotting memory usage over time in different dimensions. This is done by graph.rb. Let's start with the object type. This will create the file graph-type-mem.png showing the total size of objects by type. If there's one thing leaking, you'll probably have a number of somewhat flat lines, and one with a positive slope, which is the culprit. If it's something else, edit graph.rb and expand the case-block. In this way you may be able to zoom in on the cause. echo "\\COPY $table (`head -n1 $file`) FROM '$file' WITH (FORMAT CSV, HEADER);"
I'm going to try it out and probably share some experience using it in a few days.